But the games going on behind the scenes between the coaches, the players, the media, the money-men, and the fans turn out to be even more fiercely competitive than those on the court. Steven and his fellow winner, Susan Carol Anderson, are nosing around the Superdome and overhear what sounds like a threat to throw the championship game. Now they have just 48 hours to figure out who is blackmailing one of MSU's star players and why. Incredible book narrated by Feinstein himself! Great story. Maybe too immature for adults but great for me! Yes, this was directed at young teenagers, but it has enough of the interesting details for avid college basketball fans. Some of the "inside" descriptions are a nice touch. The names are different than the publisher's summary though. I enjoyed this audiobook, probably because, like the author, I'm a basketball junkie myself. He does a good job of integrating real people and a real event (the Final Four) with the fictional characters and the mysterious plot that the 2 young writers discover. His perspective from the point of view of an adolescent boy must be somewhat autobiographical because it seemed very real to me. I thought the author did a good job of narrating, better than most other authors I have heard. We read this for my sons book club ages 12-13. They all really liked it. This book made a long car ride with my two sons, ages 8 and 10, a lot of fun. They loved that the main characters were kids and they really got into all the backstage information on the final four. The story is about the two young sports journalists who are at the final four because they won a contest and they overhear one of the star players being presured to throw a game. In order to enjoy this book, you have to accept the flimsey resons why the kids look into this themselves without asking any of the gorwn-ups for help. If you can make that leap of belief, the rest if the story is enjoyable. Somebody else should have narrated the book, though. 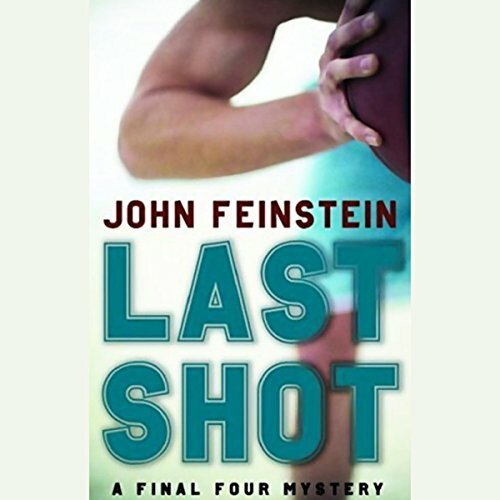 John Feinstein is a great writer but a bad narrator. Even though I have no interest in basketball, this was still a great book because it was a really suspenseful mystery with blackmail and two teenage detectives. I heard John interviewed right after this book came out. The book was written for his son who was about 12 at the time. I had great pleasure sending it to my 12 year old niece, an avid basketball player. The girl in the story is portrayed as smart and clever - a great role model for my niece. I bought the audio book, and even as a 37 year old, am enjoying the behind-the-scenes aspects of the story. This book was a very amateur attempt at fiction. He probably just wrote it for the money.